I bought my entry-level made-in-Taiwan SWB online just because I thought it looked cool. It's fun, and generates lots of grins and waves from folks in town. The trailer I bought with it slows me down somewhat, especially on the uphills, but it gives me a place to put my lunch bag when I commute to work. If I can figure out how to post a picture of it, I'll post one. Nightturkey wrote: I bought my entry-level made-in-Taiwan SWB online just because I thought it looked cool. It's fun, and generates lots of grins and waves from folks in town. The trailer I bought with it slows me down somewhat, especially on the uphills, but it gives me a place to put my lunch bag when I commute to work. If I can figure out how to post a picture of it, I'll post one. You say you bought my entry-level made-in-Taiwan SWB was it an Action Bent. Another ? what type of trailer are you pulling. No, it's not an ActionBent. The company I bought it from is a web-based company called Recumbentusa.com, based in Miami, FL. They sell a lot of their stuff on eBay. The trailer is from the same company. I love the bike and the trailer is quite handy; the company was pretty easy to deal with and shipped the bike and trailer pretty quickly; the only negative thing I would say about the experience is that the bike was shipped mostly unassembled (as one might expect), and there were NO instructions with it (to be fair, they warned potential buyers of that fact up front). I had to go by the promotional photos from their website. Fortunately it wasn't too terribly difficult, even for someone like me who had never assembled a bike before. Although the bike has a fair amount of "Made in Taiwan" feel to it, for a pretty low-priced introduction to the world of 'bent riding I would certainly give it a thumbs-up. Once I got it put together and started learning how to ride it, it took me about four days to get from "Oh my God, I'm going to Die!!!" to "Hey, this is a real blast!" It's my "ride for fun" bike. have all sorts of bags to check out. Thanks for the links, D'Mouse. I'm always grateful for more resources. Fact is, I do tend to carry a fairly good amount of stuff when I go to work, especially when the weather's warm - I need to carry warm clothes (I work in a meat-processing plant where the temp is always 38 degrees), a supply of water (the weather here in july and August can top the triple-digit mark), and assorted other stuff. 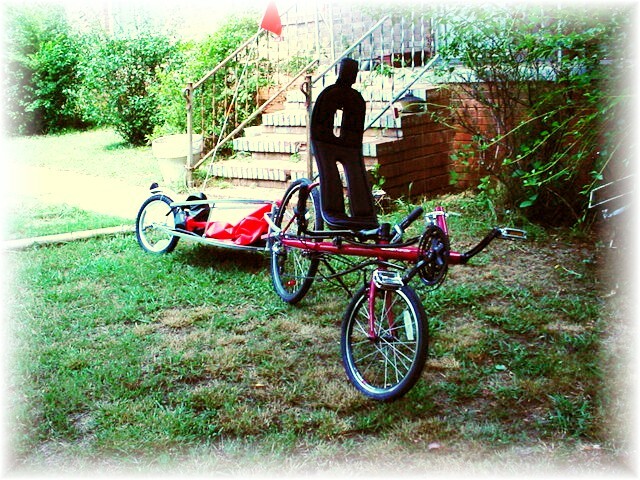 Of course, the trailer isn't permanently attached to the bike, it has quick-release clips so I can ride without it or attach it to my Peugeot upright for trips to the grocery store. Nightturkey wrote: No, it's not an ActionBent. The company I bought it from is a web-based company called Recumbentusa.com, based in Miami, FL. They sell a lot of their stuff on eBay. The trailer is from the same company. I love the bike and the trailer is quite handy; the company was pretty easy to deal with and shipped the bike and trailer pretty quickly; the only negative thing I would say about the experience is that the bike was shipped mostly unassembled (as one might expect), and there were NO instructions with it (to be fair, they warned potential buyers of that fact up front). I had to go by the promotional photos from their website. Fortunately it wasn't too terribly difficult, even for someone like me who had never assembled a bike before. Although the bike has a fair amount of "Made in Taiwan" feel to it, for a pretty low-priced introduction to the world of 'bent riding I would certainly give it a thumbs-up. Once I got it put together and started learning how to ride it, it took me about four days to get from "Oh my God, I'm going to Die!!!" to "Hey, this is a real blast!" It's my "ride for fun" bike. Does it have a number 933? I import and sell recumbents from Taiwan and I’m also a dealer for several manufactures here in Norway. I have imported from the same company but not your model. Peder, I don't recall seeing a number 933, but I'll be glad to go and take another look - where would the number be located? Nightturkey wrote: Peder, I don't recall seeing a number 933, but I'll be glad to go and take another look - where would the number be located? The number might not be on the frame. These bikes are sold in different countries and can have different names. The manufacture uses numbers to identify the model but not sure if he will have the number on the frame?